Finally, the 10 years wait was over and we could finally see the war to get those infinity stones in the Marvel Cinematic Universe. We in Indonesia were quite fortunate to be 1 of the few countries given early premiere of this major blockbuster movie. When it was announced that the movie tickets were pre-sold last week, so many people were anxious to get the tickets for the first day show. So it was rather frustrating when the online ticket sale for the biggest cinema chain was not updated until 10 AM that morning while the others had already been sold 3 hours earlier. Nevertheless, my wife and I were able to buy 2 tickets at a big cinema near our home. Unlike my usual brief story line/synopsis, this time, I do not want to reveal too much of it, so I am just going to copy paste the summary from this film's IMDB post. OK, so this movie was able to live up to the hype. It was almost the perfect superhero team movie. You got the suspense, the comedy, the drama, the fun interaction amongst the heroes, the various superhero fights and the quite epic battle finale. During our whole 2.5 hours, my wife and I (and all the audience) were quite captivated by this movie and we could enjoy it a lot because almost everyone were absorbed in the film, that very very few individuals were looking at their mobile phones which were a distraction. The movie started off quite brightly with the introduction of the main villain Thanos (played by Josh Brolin - Milk, Jonah Hex etc and funnily enough would be playing as another Marvel's X-Men character Cable in the upcoming Deadpool 2 movie). Now this would be the part that I did not really favor cause personally I felt that the filmmaker tried to humanize Thanos too much and (probably) trying to create sympathy to his character, which to my opinion sometimes made the pace of the movie became slower during some of his more dramatic scenes. But then again, that was only my opinion, whereas people might view his characterization as a good way to introduce the villain. Due to such a huge group of superheroes who have been introduced to us in the past decade, all of the audience really could not wait for them to appear. Which was why whenever the favorite hero showed up, people would cheer (including my wife). There was 1 huge moment involving Thor that I really reaaaally loved and it even made some audience clapped their hands. Oh there was also 1 very funny moment involving Okoye (Danai Gurira), the general of Wakanda from Black Panther. Be sure to catch that scene. Before I forgot, those new costumes and look for heroes like Captain America, Spider-man and Iron Man were awesome! To my surprise, the movie did not feel too packed even though it had so many of them heroes. Most of them got sufficient screen time (obviously some got more than others), but to me it was quite balanced. What I did not really get was the "campaign" of keeping silence & not giving spoiler to the movie because I do not think it has so many twists or surprises that would shock audience. Let's face it, this is not a Sixth Sense or Seven movie where the ultimate finale was totally a major surprise which would be a very bad spoiler had people known from the beginning. And my wife also shared her view that not sharing spoiler should have been applicable to all movies anyway. Back to the movie itself, it had all the necessary ingredients to be a huge commercial success. Audience loved it, critics might view this as good though not excellent, but certainly enough not to let people think twice to see. The CGI, special effects, motion capture were awesome (it was definitely worth the hefty price tag of USD 300-400 million budget). The sound effects despite having Dolby Atmos system felt not really spectacular. The funny moments especially involving those Guardians of the Galaxy heroes (and their interaction with other heroes) were also nice to see. 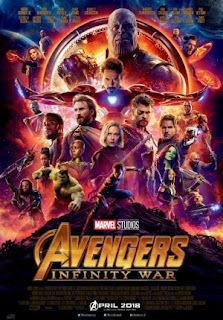 The ending though probably not as desirous for me, but it did give us a hint of what's coming in the next Avengers movie showing in May 2019 (which could not have come soon enough). And there was only 1 post end-credit scene which would be linked to the next Marvel movie also coming in 2019. If you are not sure what it was, you could search for it after you finished seeing the movie. This movie was directed by Anthony and Joe Russo who were directors of films such as Captain America: Civil War, Ant-Man, Community TV series (no wonder they were able to put some comedic moments in this film). In the end, this was an exhilarating movie, full of fun moments, excitement and few brief emotional moment. It is a movie about war for the magical infinity stones (but do not imagine a bloody brutal violent war movie since this has PG-13 rating) and a reminder that some heroes are also human. I am quite sure this would shatter a lot of box office records, be it in the US itself or in the world. We will just see how successful it would be. So for those who are looking forward to see this movie, do not worry, it is as good as the hype. Just go and enjoy this film as soon as you can, so you could have the bragging rights of being some of the people who have seen it first.